I’m one excited (& nervous) gal as last weekend I dropped off my piece for an exhibition at the Virginia Gallery(*) in Glasgow’s Merchant City. Ian and Drew, the owners, thought they would celebrate the queen’s jubilee in their own way. That is, to invite 60 new and emerging artists to produce 60 unique pieces using queen as the inspiration and I’m one of them – yikes! They gave us free rein to interpretive word as we pleased and I’m really looking forward to seeing what everyone has come up with. 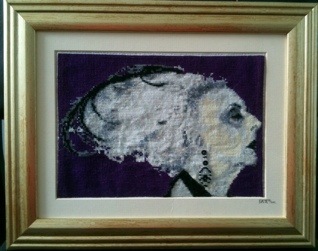 As for me, well I made a cross stitch of this classic queen…d’u recognise the person? This entry was posted in cross stitch, Events, exhibition, frayedattheedges, Glasgow and tagged art, cross stitch, exhibition, glasgow, Merchant City. Bookmark the permalink. It’s a fantastic exhibition & I’m really chuffed to be a part it it. 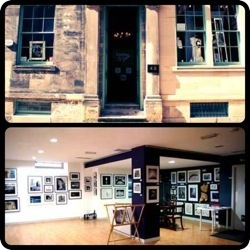 Looking forward to hearing about more of your open exhibitions I can take part in too.